It’s hard to argue a down global economy with the rise in inquiries for products and services from Dos Santos International (DSI). In 2012, the inquiry level rose 30% from years past, including 2005 when the economy as a whole seemed to be flourishing. The pace in 2013 is even stronger. The recognized potential for DSI systems, particularly for Snake Sandwich High Angle Conveyors, the DSI flagship, is impressive to say the least. The DSI Snake conveyors utilize two smooth surfaced conveyor belts, face-to-face, to gently, but firmly, hug the bulk material between them as they elevate the product continuously at high incline angles even to 90° (vertical). Featuring unlimited capacity and smooth surfaced rubber belts that can be scraped clean the system is ideal for the high volumes in tight spaces at transfer terminals both land and marine based. DSI’s activities in the conventional conveyors and their structural and mechanical engineering services have been particularly strong with yard and port projects in North America, Europe, Asia and the Middle East. Activities in the USA southern coast, on the Gulf of Mexico, include engineering support and equipment sales for a major terminal expansion. 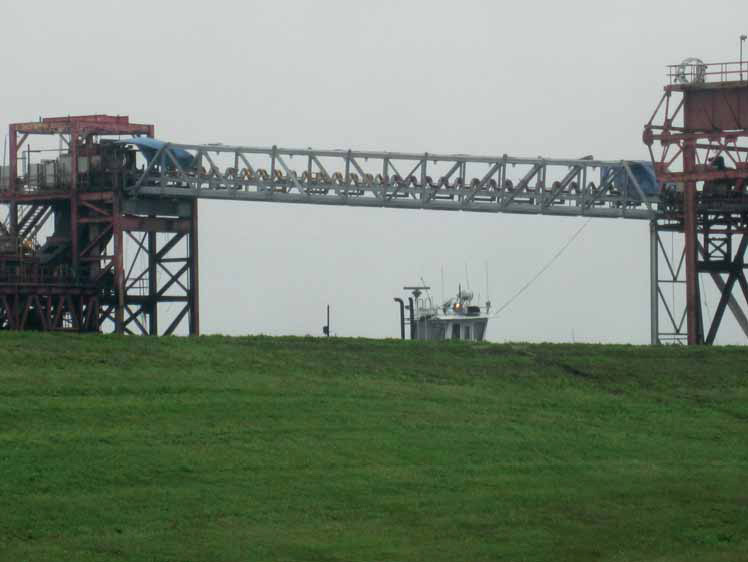 Heralded by the new DSI truss bridge, that connects the customer’s major storage yard to the shiploading dock, the project includes a major conveyor complex for increased yard storage, a new stacker/reclaimer, two fixed wing stackers and three shiploaders. A new DSI Snake will provide the most direct path from the continuous barge unloader (CBU) to the reversing yard conveyor. Thus the unloaded bulk can be sent to the storage yard or directly to the ship via the new shiploaders. This new DSI Snake will utilize the widest belts and deliver the highest volumetric rate to date. The new, promised potential comes on the heels of the promises fulfilled. In this regard who could forget the highly compact, highly mobile DSI Snake Shiploader at the Port of Adelaide, on Australia’s southern coast? There is no better example of the versatility of a DSI Snake. Australia’s first Snake Shiploader elevates a variety of high value ores from trucks to ship. Conventional conveyors would not have fit the limited dock space which required a smaller footprint. Dos Santos International, being a global authority on high angle conveying was able to fit the space easily by being able to elevate at a 50° angle. Materials for export are trucked to the dock and dumped onto a special, 3.2 metre-wide feeder. The ore is fed continuously and uniformly onto the mobile snake’s receiving chute. The Snake Shiploader elevates the bulk over the ship’s deck to the hatch where it is discharged into the ship’s hold. At the Snake’s discharge, a special telescoping chute, with rotating, pivoting spoon, facilitates even and complete filling of the holds. The mobile Snake is carried on a tripod of twin rubber-tyred wheels. Each set of twin tyres is mounted at a vertical kingpin and can rotate 360° about the vertical axis. Thus, without repositioning, the Snake can set up to travel in any direction. With the tail tyres fixed, the front tyres can be oriented and travelled for a slewing motion. The unit was complete in November 2006. Now, with seven years of proven operation this first DSI Snake Shiploader for Australia has set the pace for many more high volume high-angle installations at materials handling docks and yards throughout the world.